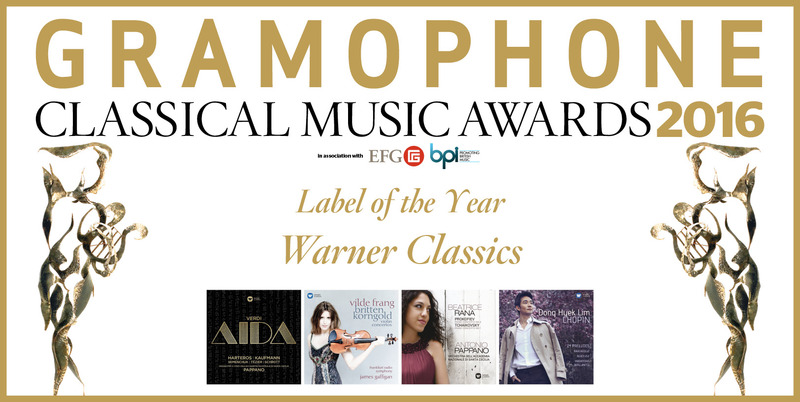 Warner Classics, the guardians since 2013 of both the EMI catalogue and its many labels as well as those of Teldec and Erato, has had a very impressive year. Of course it’s no surprise to us at Gramophone, because the guiding light behind the label is its President, Alain Lanceron, one of the truly inspired A&R executives on the classical record scene today (and the recipient not only of a Gramophone Award for Special Achievement in 2013 but also a welcome entrant to our Hall of Fame, voted for by our readers, the following year). Lanceron oversees both Erato (which has become the new home of both ‘old’ Erato and Virgin Classics) and Warner Classics, and has allowed each label to assume a different but complementary identity, and this year has seen each label flourishing. Almost exactly a year ago, Warner Classics unveiled a rare studio recording of a core opera, Verdi’s Aida conducted by Antonio Pappano who has been a key artist on the label and its predecessor, EMI, since 1997: it received almost universal adulation and this year adds our Opera Award to its list of accolades. And violinists, too, sit at the heart of what the label has been up to – violinists of the past (as personified by the magnificent Yehudi Menuhin centenary box) as well as violinists of the present (Vilde Frang’s Award-winning coupling of violin concertos by Britten and Korngold and the revitalising of the recording career of the great Kyung Wha Chung whose solo Bach is reviewed this month). Warner Classics and its predecessor EMI has always had a rich tradition of fine pianists and Dong Hyek Lim gave us (last November) a really magnificent, and fresh, new take on Chopin’s Preludes. It was followed (in December) by the first disc from the newly signed Italian pianist Beatrice Rana (a former BBC New Generation Artist). Joined by Pappano and his Roman orchestra, she gave us Prokofiev’s Second and Tchaikovsky’s First Concertos.